The ACE burn off Oven Model 3160 RT is designed to remove oil, varnish, paint, and combustible material debris from metals. The oven is made from sturdy 11 gauge steel, and painted with anti-corrosive and temperature resistant blue enamel paint. The automatic oven helps reduce hassles, and investment. The oven features a One Touch Control System (OTC), which monitors combustible vapors in the system, and maintains them at a safe level. The oven discharges harmless combustible byproducts into the atmosphere, thereby conforming to EPA air emission standards. Volume Over Cart 150 CU. FT.
1 Top Mounted Pressure Relief Hatch 13.38 SQ. FT.
*ACE provides a 1 year warranty from the date of sale, to repair, or replacement of any defective part. 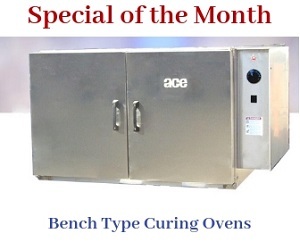 The warranty is applicable only if the oven is installed, maintained, and operated as per ACE’s recommendations. Any deviation from recommended installations may result in changes to the above-mentioned date.